What is “Theta” meditation? Theta brainwaves operate between 4 and 8 cycles per second. Theta is associated with intuition and inspiration, it is the bridge to our our subconscious. It is activated during dream sleep and deep meditation states. The Theta brainwave frequency is also associated with creative thinking, allowing us to tap into our subconscious mind, and our inner genius. Some people also achieve out of body experiences during a deep Theta brainwave state. This particular Chakra balancing meditation starts at a binaural beat of 20.3 Hz (Beta) and ramps down gradually to a Theta binaural beat of 4.5 Hz, then back to a binaural beat of 14.1. Consequently, you should only use this in a time and place where it is OK to possibly fall asleep. To take advantage of the binaural beats, you must use headphones, and be in a time and place where it is OK to relax, or even fall sleep. To learn more about binaural beats, click here. This binaural beat meditation starts at the Root Chakra, and progresses up to the Crown Chakra. The total time for this Chakra balancing Theta meditation is 42 minutes. The Theta Healing Chakra Suite download includes a 9 page eBook with complete information all about the Chakras. Our automatic download system will redirect you immediately after payment to a download page, and also send you an e-mail with download instructions. If you don’t see the e-mail, check your spam filter. iPad & iPhone don’t use Pay Pal, use the iTunes button. Theta Chakra Healing Android & Amazon Fire Apps. 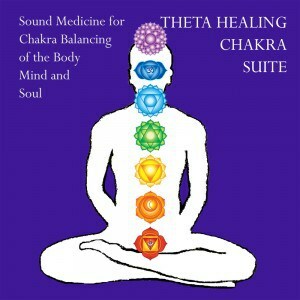 To Buy The Healing Theta Chakra Suite on CD for $12.95, Click Here.